How Has Hurricane Michael Affected the Market? 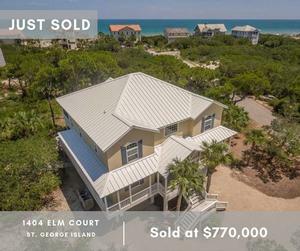 While Hurricane Michael has impacted the SGI real estate market, we are also seeing positive signs for a return to a healthy and active market. Closings have remained steady, and sales prices are holding strong. Pending properties are lower when compared to the same time period as last year. As visitors to the area increase for spring and public knowledge on the island's beautiful and nearly untouched condition continues to spread, we are optimistic for a great year and many happy, new homeowners. During the same time period of the previous year, 21 homes sold for a total volume of $15,643,000 (10/10/2017 – 2/2/2018). There are 6 homes currently under contract on SGI – Click to View Properties - https://bit.ly/2IvYe9t At the same time last year, there were 17 homes under contract on the island. There are 5 home currently under contract in Apalach – Click to View Properties - https://bit.ly/2XhKkLj At the same time last year, there were 14 homes under contract on the island. 1404 Elm Court Sales Story :: The buyer of this custom home in the Plantation community cancelled the original contract because of concerns about the storm prior to its landfall. Months later, the deal was closed with the same buyer for the same price that it had been contracted at before the storm.